Robust broccoli rabe is one of my most favorite tender and crunchy vegetables. This brassiceae holds up well as a simple side dish when sautéed with garlic, chili flakes, and olive oil or as a pleasant addition to grain salads. 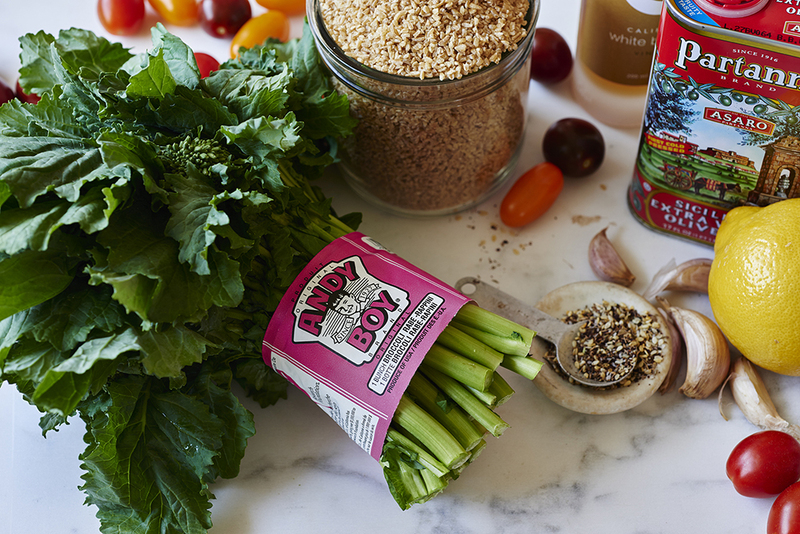 In this recipe, the broccoli rabe is cut with sweet roasted cherry tomatoes, roasted garlic dressing, and zesty roasted lemon. Hot, cold, side dish or main, this grain salad is sure to be a crowd pleaser. *Chef’s note: This recipe can be made gluten-free if brown rice or quinoa is substituted for bulgur wheat. Miranda is the author of Crunchy Radish, a clean-eating and healthy-living food blog. She is a registered dietician and a big believer in the impact proper nutritional choices can make in your life. 2. Cut ¼ inch off the top of the garlic to expose the tops of the garlic cloves. Drizzle 2 teaspoons of olive oil over the exposed surface of the garlic. Wrap in parchment paper, then in foil and bake. Check the garlic after 40 minutes. It is ready when the cloves are completely soft and a knife can easily pierce the flesh. Allow to cool and squeeze garlic from the skin. 3. On two separate sheet pans lined with parchment paper, arrange the lemon slices on one tray and the cherry tomatoes on another. Toss lemons with 1 tablespoon of olive oil and a pinch of salt and pepper. Toss tomatoes with 1 tablespoon of olive oil and 1 tablespoon of za’atar. 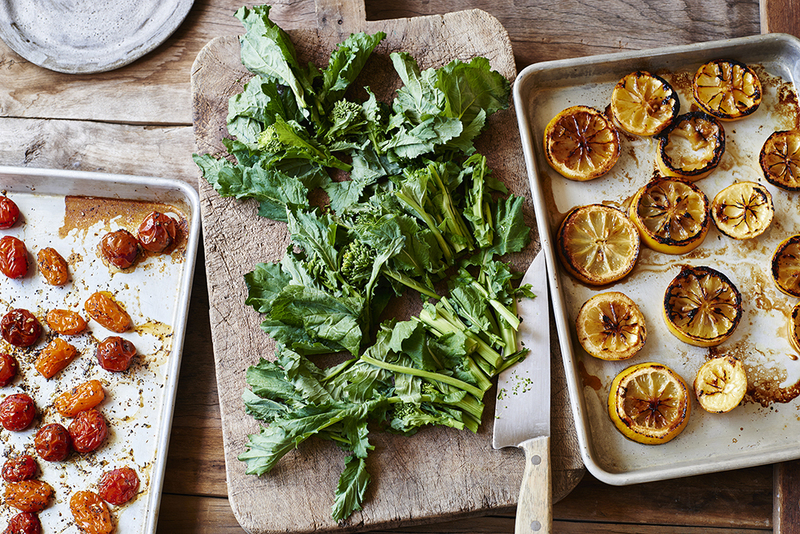 Roast lemons for 15 minutes and tomatoes for 20-30 minutes, or until slightly shriveled but still juicy. Toss half way through. 4. Blanch the broccoli rabe for 2 minutes in a pot of boiling salted water. Submerge in an ice bath and squeeze dry. Coarsely chop and set aside. 5. Place 2 cups of water and 1 cup bulgur wheat into a small pot. Bring to a boil. Cover and simmer for 12 minutes. 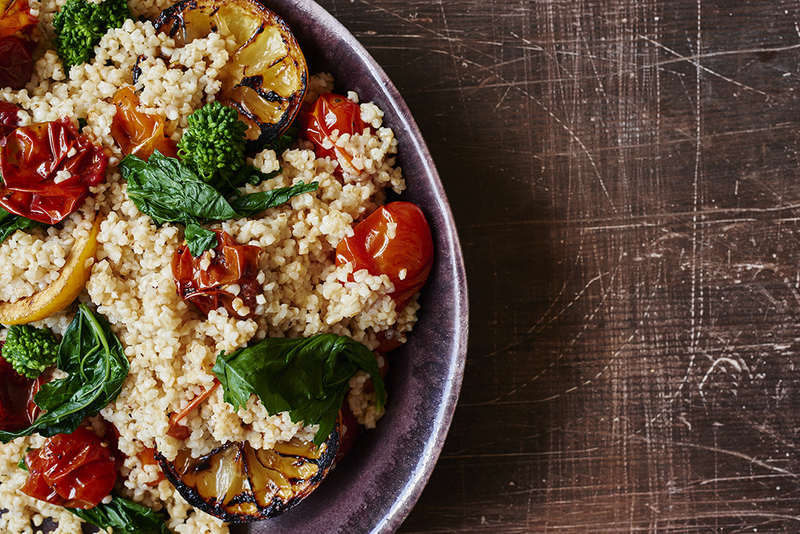 Drain any excess water, and place bulgur wheat into a large bowl. 6. For the dressing, combine roasted garlic cloves, lemon zest, lemon juice, golden balsamic vinegar and a pinch of salt and pepper in a blender. Drizzle in olive oil with the motor running. 7. Pour 1 tbsp of dressing into bulgur wheat and gently fluff. Toss in the broccoli rabe and most of the tomatoes and lemons. Add the rest of the dressing, and gently toss together. Garnish with reserved tomatoes and lemons. Enjoy.